Participate offers pre-service and in-service teachers with grade-band specific professional development focused on the integration of global concepts within the curriculum. The platform integrates professional development modules, a robust online community and curricular resources to support teachers in their integration of global concepts across subject areas. Educators learn strategies for transforming teaching practices and impacting student learning by implementing ready-to-use lessons and developing their own as they progress through professional development modules. Teachers can collaborate and share evidence of their learning in a trusted online community, earn and collect digital badges in living portfolios and work toward global-ready teacher designation. All participant-created content is standards-aligned and rooted in global project-based inquiry. Upon completion of each professional development module, teachers are awarded hours that may be used toward license renewal credits. The Participate professional development courses successfully underwent the International Society for Technology in Education (ISTE) Seal of Alignment review for Proficiency. 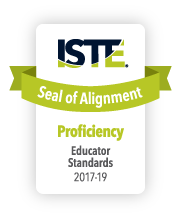 Reviewers determined that this resource provides substantial opportunities for participating teachers to practice the skills and knowledge necessary to meet the ISTE Standards for Educators. With 50 project-based learning modules, participating teachers learn about how to integrate global concepts within their curriculum and various tools for enhancing student learning in a global context. With technology as a common thread throughout the entire program, teachers apply digital tools in their own learning and as well as how to effectively use digital tools to support student learning in an integrated way.